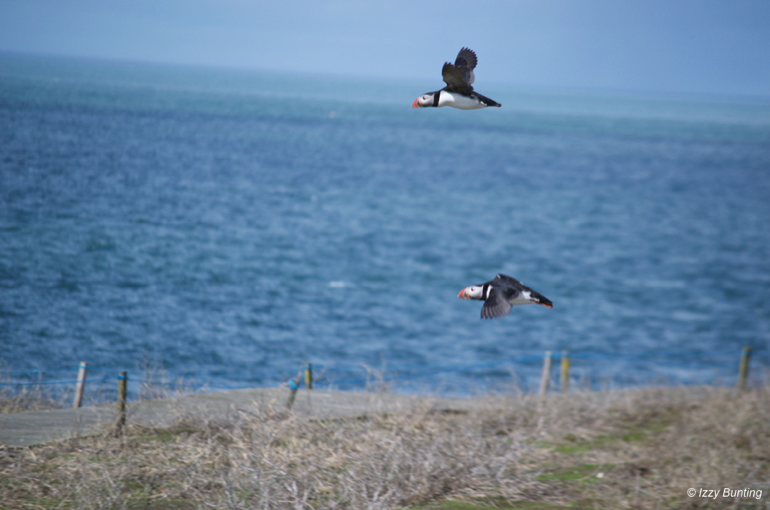 Seeing puffins has been at the top of our family's wish-list for years. With its unmistakable brightly coloured bill, comical gait and endearing expression, the puffin is one of the UK's most-loved birds. 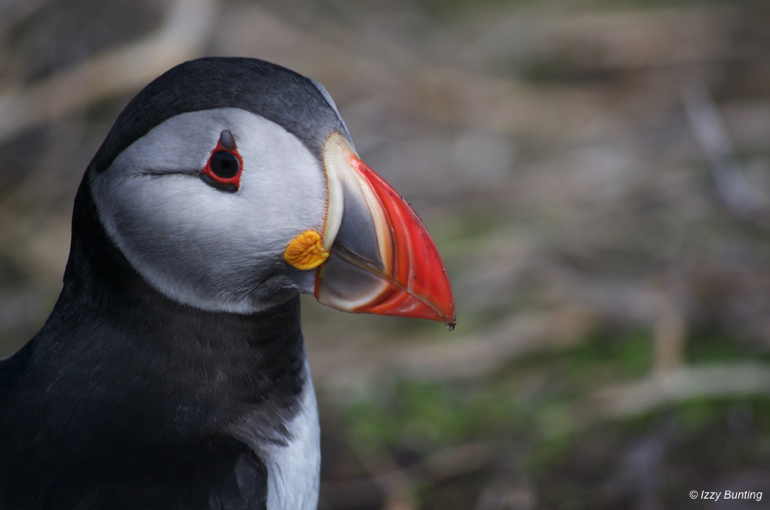 There are several places in the UK where you can see puffins – including Skomer Island in Wales, Lunga Island near the Isle of Mull in Scotland, and Bempton Cliffs in Yorkshire. But we opted for the Farne Islands, in Northumberland, for our puffin adventure. 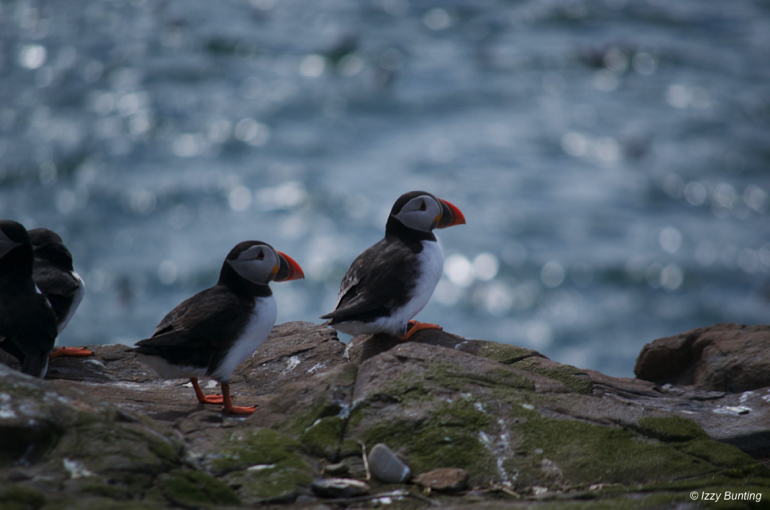 The islands are home to a large puffin population – and, being just a short boat ride away from the seaside village of Seahouses, they are easily accessible. When it comes to spotting puffins, you have to be in the right place at the right time. Puffins spend much of the year out at sea, coming ashore to breed in late March or early April. Once on dry land they make burrows to nest in and rear their young, before heading back out to the water around the end of July. We arranged our trip to Northumberland in mid-April, feeling confident that our timing would be spot-on for getting some pretty good sightings of the birds. But during the first part of the month a prolonged period of stormy weather threatened our plans, by putting the puffins off returning to the Farne Islands. Would they arrive in time for our visit? Every day for the week before our trip I'd checked the tweets of the skipper of Serenity – the boat we were booked onto for visiting the islands – to find out whether the birds had arrived yet. 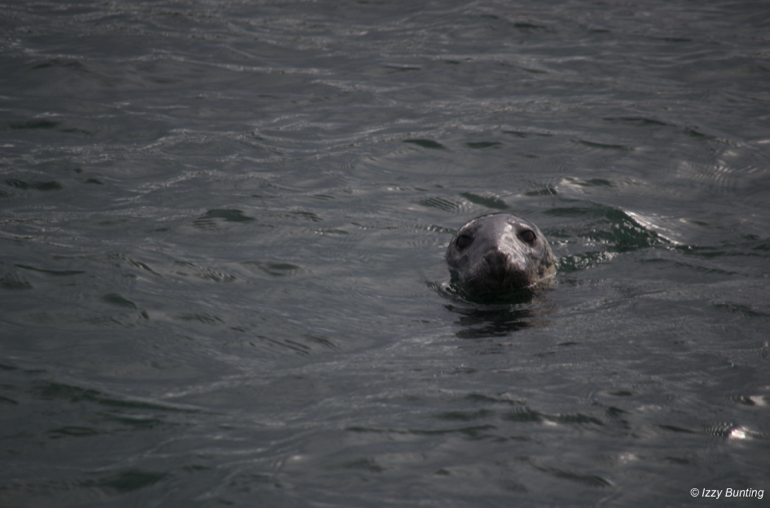 But although a few had been sighted, they had been deterred by the bad weather and had headed back out to sea. The day before our boat trip, the storms had completely subsided and we visited Lindisfarne in beautiful calm, sunny weather. We asked the National Trust ranger at Lindisfarne Castle whether the puffins had arrived on Inner Farne yet. “I think about eight have been spotted,” she told us. This didn't sound too promising. If there were only eight birds around, our chances of catching a glimpse of one of them seemed pretty slim. On the morning of our boat trip we woke to blue skies. The weather was perfect, and we began to feel more hopeful. We headed off to Seahouses, where we first visited the National Trust office on the quayside. 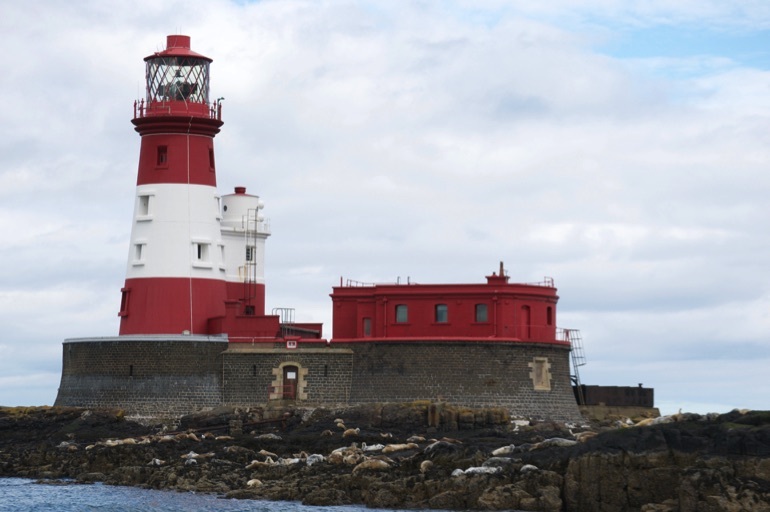 Visitor numbers to Inner Farne are limited, so all visitors must buy a permit from the National Trust (free for National Trust members) before boarding a boat. 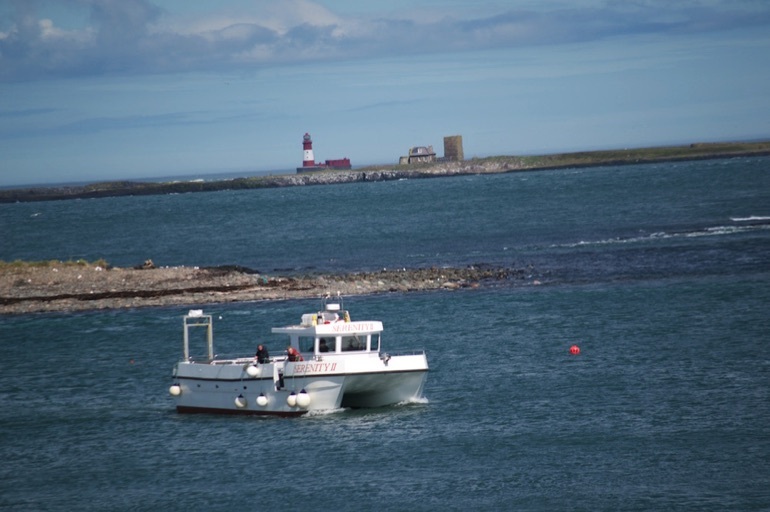 There are a handful of Seahouses boat operators with licenses to land on Inner Farne. We chose Serenity – a purpose built catamaran, with a spacious open deck that allows photographers plenty of freedom to move around and get a good all-round view of the wildlife. The Inner Farne Tour onboard Serenity cruises around Staple and Longstone Islands, getting close up to the cliffs to see the seabirds, before landing on Inner Farne, where much of the islands' puffin population sets up home. Visitors then have an hour to explore the island before heading back to Seahouses. As well as the skipper, Andrew – who gave an informative commentary during the trip – there were two crewmembers on board. Andy and Chris were armed with binoculars, ready to point out any interesting sightings of seabirds or other wildlife, and to share their extensive knowledge. And within half an hour of setting out, Andy pointed out a group of birds bobbing in the sea a short distance away. 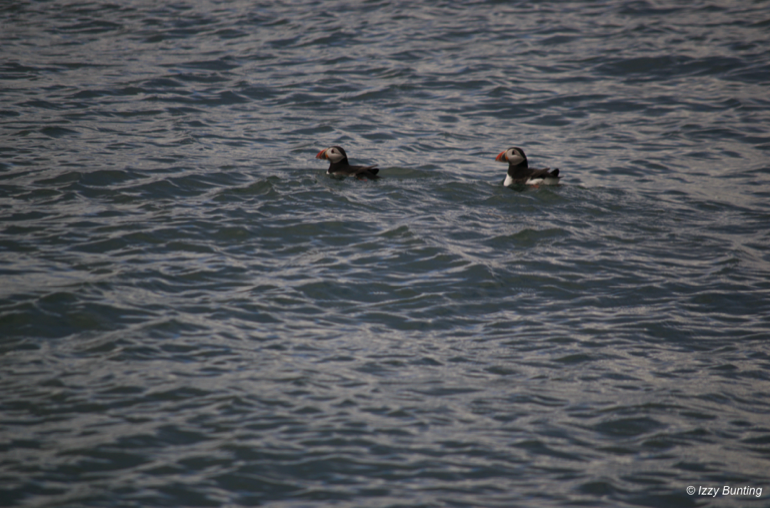 Puffins! I was over the moon. That first glimpse was magical, and something I'll never forget. And, having spotted the birds, I felt I could relax and enjoy the rest of the boat trip. And there was plenty to enjoy. I'd been so focused on spotting puffins that I wasn't prepared for all the other remarkable wildlife that can be seen on and around the Farne Islands. 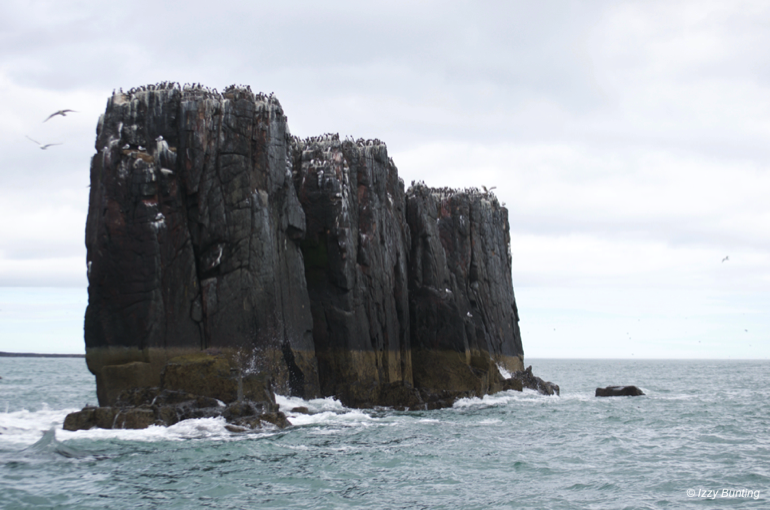 We headed towards Staple Island, where thousands of guillemots nest each year – the cliffs and surrounding sea stacks were teeming with the black and white birds, their cacophonous calls deafening us as the boat slowly approached the cliffs and the engine was cut. 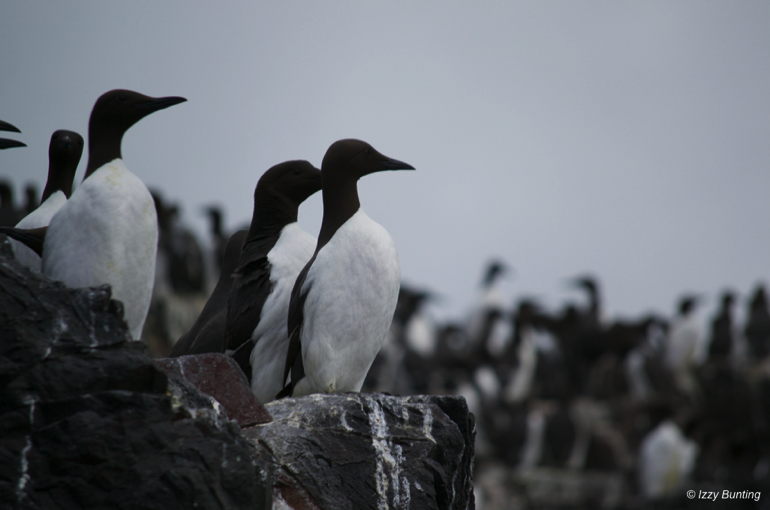 “Look out for the bridled guillemots,” said Chris, pointing out a bird with a distinct white stripe across its eye. 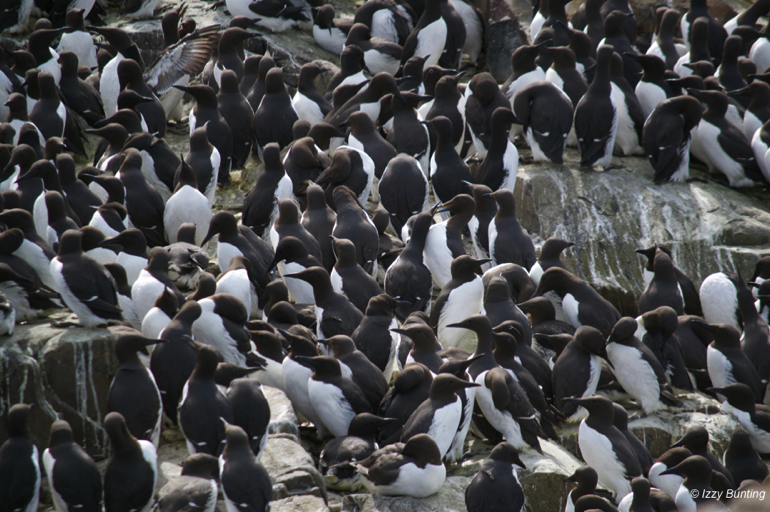 In the UK, guillemots are the most common bird in the auk family – the same family as the puffin – and, like puffins, they only come to land to nest, spending the rest of their lives at sea. Next we headed further out, towards Longstone Island with its distinctive lighthouse. It was here that the famous Victorian heroine Grace Darling lived – her father William was the lighthouse keeper, and together they rescued the survivors from the wreck of the paddle steamer the 'Forfarshire' in 1838. As we cruised slowly towards Longstone Island, the grey, cream and brown rocks along the shore began to move. 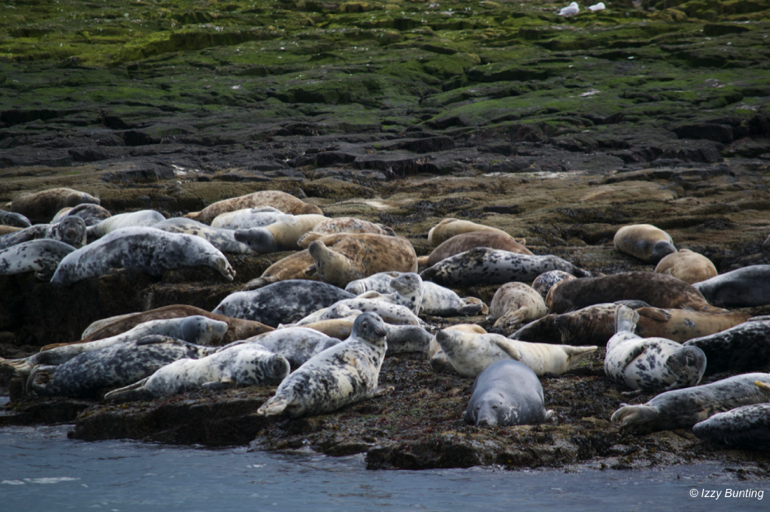 The squirming, rolling and wriggling forms turned out to be grey seals – there are thousands of them on the Farne Islands, making this one of the largest seal colonies in the UK. Each autumn hundreds of pups are born here. There were seals everywhere, lounging on the shore and bobbing up and down in the water to get a better look at Serenity as we cruised slowly by. The final stop on our Farne Islands cruise was Inner Farne. We headed off the boat and up the hill to a medieval chapel and information centre. Here we chatted to a National Trust ranger – and I was excited to tell her about our puffin sighting. On hearing this we headed straight out to the nesting area – a large grassy hilltop, surrounded by a boardwalk to allow visitors to get a good view of the birds without disturbing them. Straight away we spotted a puffin, sitting half-hidden in the grass. It was much smaller than I'd expected – more the size of a dove than a duck. Then we spotted another, and another. As we walked along the boardwalk, we realised there were puffins everywhere. They were popping in and out of burrows just metres away from the boardwalk, and perching in groups on the rocky cliff edges. But most exciting were the birds that were still arriving on the island – especially the ones that were swooping just a few inches above our heads! This was no longer a case of just 'seeing' puffins. This was a full-blown puffin experience. As if the puffins weren't enough, we got some great close-up views of some of the island's other seabirds too. 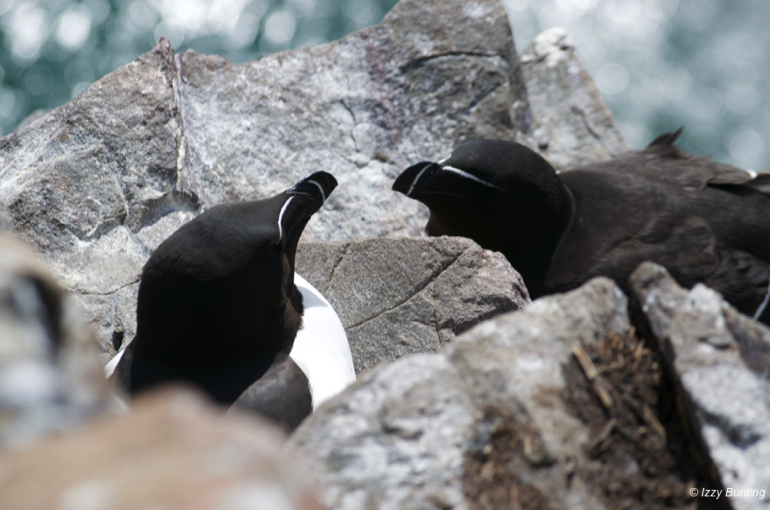 There were guillemots everywhere we looked, and razorbills nesting on the cliff edges. 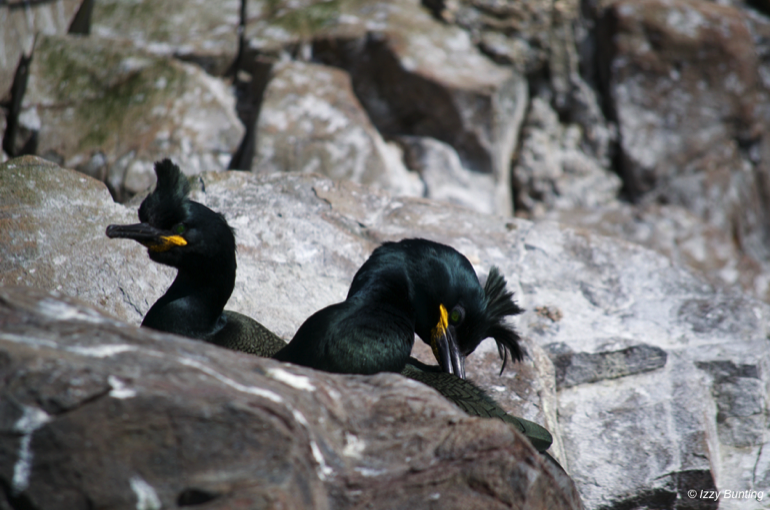 And the shags were particularly beautiful, with their iridescent green-black feathers and distinctive breeding crest. 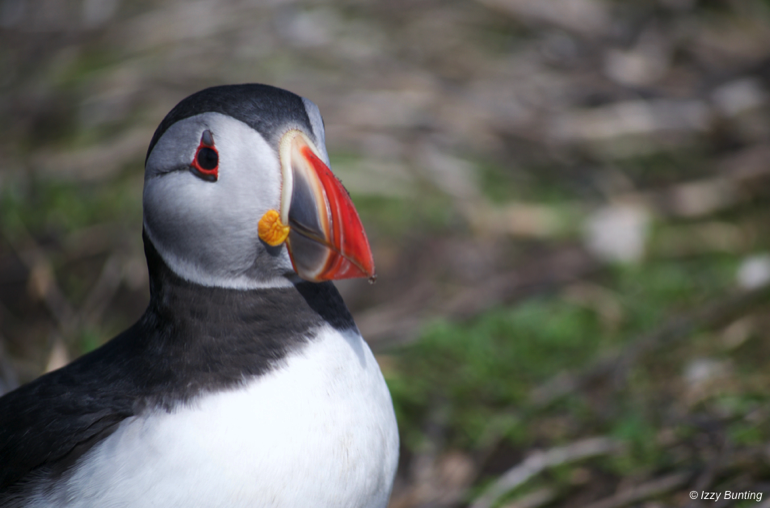 For nature lovers, a trip to the Farne Islands is a must – the chance to get so close to such wonderful birds shouldn't be missed. And by visiting, you help support vital ongoing work to protect one of the country's most important seabird colonies. 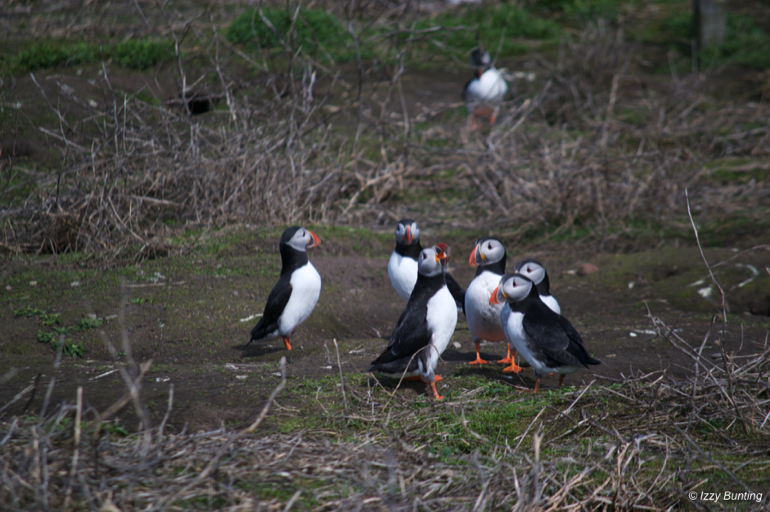 This year the National Trust rangers on the Farne Islands will be counting the puffins. Every five years, a full puffin census is undertaken, counting numbers of birds to see if the size of the colony has changed since the last survey. 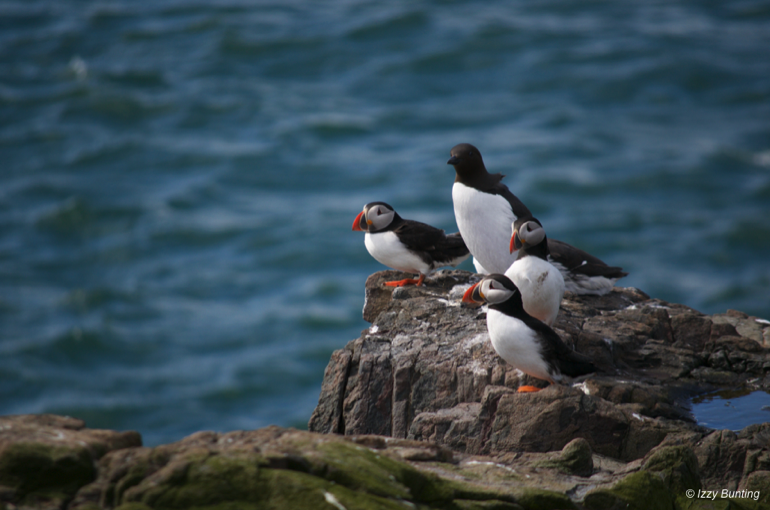 This information is used to inform decisions that help protect the puffins. Puffins have traditionally thrived on the Farnes – due to protection of the birds, good sources of food, a lack of ground predators and the availability of suitable nesting areas. However, initial figures for 2018 reveal that numbers may be down by an average of 12 per cent on the last count in 2013, when 40,000 breeding pairs were recorded. Puffins are a red-listed bird species. This means there has been a severe decline in the population of this charismatic bird over the last 25 years. Over half of the UK population is based at just a handful of sites. 2018 marks the 25th anniversary of the Farnes achieving National Nature Reserve status. The National Trust's work to care for the Farne Islands is critical to puffins' ongoing breeding success. The results of the full 2018 census will be announced in October. For more information about the Farne Islands visit www.nationaltrust.org.uk/farne-islands.